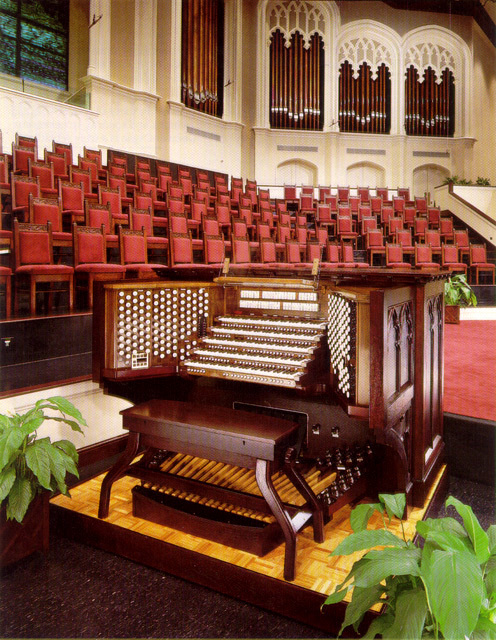 From the Service of Dedication booklet, August 10, 1990: The five manual and pedal pipe organ is a monumental instrument of 231 ranks, 12,877 pipes, 9 divisions, and console. The Sanctuary was designed to highlight the exposed copper piping of the instrument. The rear organ is comprised of three unique sections . . . the Antiphonal Organ, the Organ EnChamade, which is composed of 134 trumpets, and the Chimes. This instrument lends itself to be used in conjunction or in dialogue with the main organ. The completed instrument is one of the largest instruments of its kind in North America. This magnificent instrument is a fitting contribution to the Worship and Praise of this noble congregation -- to the Glory of God and the forwarding of His kingdom on earth. The instrument was actually acquired in three increments. The original acquisition was the 4 manual 65 rank pipe organ acquired by the First Baptist Church for the former Sanctuary. This organ was built by Ernest M. Skinner in 1939 and served this church from that time until the construction of the present Sanctuary was begun in December, 1987. At the time of its construction, the Skinner organ was reputed to be the largest church organ in this country south of Washington, D.C. The second acquisition was a portion of Opus 1312, built by Casavant Freres Limited of St. Hyacinthe, Quebec, for the Concert Hall of the Royal York Hotel of Toronto, Ontario. The Casavant organ boasted 5 manuals and 108 stops. At the time, this instrument was constructed, it was the largest pipe organ in Canada and one of the largest in the world. It was also one of the last organs to have been built under the guidance of Samual M. Casavant who died several months after its completion. This organ was dedicated at the opening of the Royal York Hotel on June 11, 1929. The dedicatory recital was given by J. Claver Casavant. The third acquisition was the construction of the magnificent console and the new pipe work. This pipe work consists of the beautiful facade pipes, the combining of the Skinner and Casavant organs, and the building of additional ranks. All these elements have come together with the installation of the instrument in the new Sanctuary of the First Baptist Church of Jackson. This work completed the third and final phase of the instrument being dedicated today. Dieter M. Geissler, the organ builder, worked closely with Rick Land, organ consultant, Richard Dean, architect, and the Building Committee of this church, chaired by Zach Hederman, Sr. The five manual console of the great organ is constructed of red oak and laminated black walnut. The console was constructed to match the millwork used throughout the Sanctuary. It is mounted on a moveable platform with a parquet floor and is one of the most luxuriously equipped consoles in the world. The bench is adjustable and is constructed of red oak, as well. There are 239 draw knobs on the console. They are marked with either a "S" or "C" which denotes that stop being either from the Skinner Organ or the Casavant Organ. Those without markings denote a new stop. There are 52 couplers and 105 foot, toe, and thumb pistons on the console. The combination action provided in the console gives the organist 735 possible combinations to work with. The console also features a programmable Crescendo. 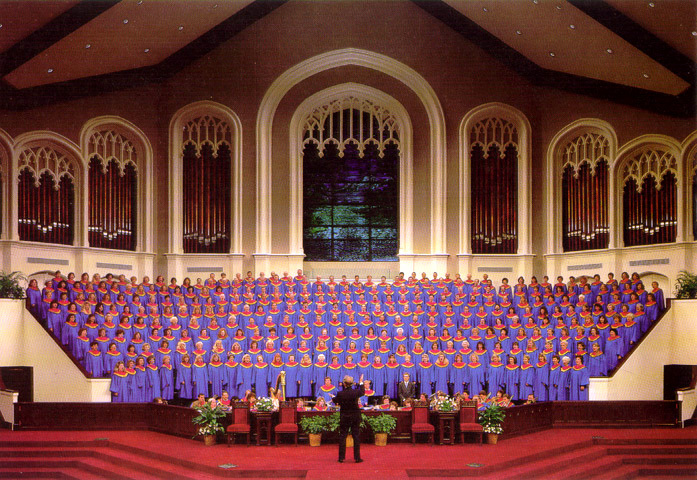 As planning began in the early 1980s for the new Sanctuary of the First Baptist Church, planning also began for the building of a great organ. It was believed that a larger, more powerful instrument was needed to support the new, 3,250 seat facility. The dedication of this instrument is a fitting climax to the $22,500,000 building program. We dedicate this instrument today as commanded in Colossians 3:17 (NIV): And whatever you do, whether in word or deed, do it all in the name of the Lord Jesus, giving thanks to God the Father through Him. Special thanks to Marvin Jochimsen for providing these pictures and the Service of Dedication booklet.